It is the recommendation of the American Dental Association to have a dentist perform a clinical exam and professional cleaning on a consistent basis. For most patients, this is performed every six months or twice a year and is considered preventive dentistry. However, for some patients, these procedures may need to be performed more frequently, with visits every three to four months resulting in either three or four yearly appointments. Periodic Oral Examination: An oral exam is the evaluation of teeth and soft tissue. Dr. Cochran uses clinical examination and radiographic imaging to determine the overall health of your mouth. We look at, not only the teeth, but also the soft tissue including the gums, tongue, and roof and floor of the mouth. We also may examine the jaw and neck including lymph nodes. There are many connections between overall health and the status of the oral environment. The link between the mouth and the rest of your body, allows us to look for signs of diabetes, cancer, and other diseases and disorders. Often signs may present orally before any other bodily indicators are found. Panoramic Radiographs: A special machine is used to capture a radiograph of the lower portion of your face including the upper and lower jaws and structures inside your skull like your sinuses, nerves and other bone formations. The image produced is useful in determining the developmental stage and location of teeth in younger patients and overall oral health status in adult patients. These types of x-rays are captured without the need for a sensor inside of the mouth. This allows us to capture the necessary images on patients who may have difficulty with taking pictures with traditional films or sensors inside of the mouth. We generally try to capture a ‘Pano’ every three to five years. Often the first time a panoramic image is taken is during around the age of 10 years to determine if orthodontic treatment might be needed or if there are any delayed or missing teeth. Then next film is usually taken to determine the position of third molars and any need for extraction. After that the films are utilized to monitor the health of the bone around the teeth and can also be utilized to find and decay within the teeth. 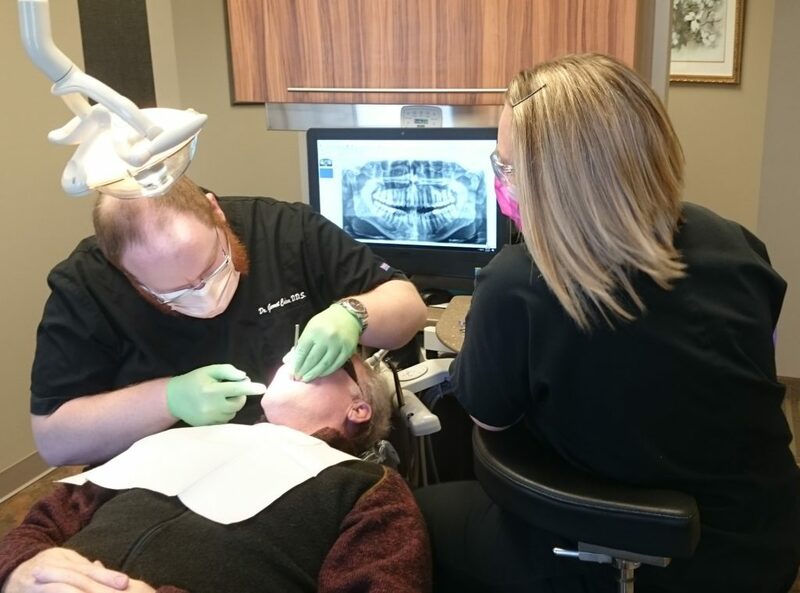 Intra-Oral Radiographs: Utilizing new intra oral digital sensors, we are able to take high quality radiographs of the structures within your mouth. These images allow us to visualize the inside of the teeth and determine if any decay is present on the surfaces of teeth that are not seen during the clinical exam. These pictures can also be used to help determine the presence of pathologies within the tissue and bone surrounding the teeth, including periodontal bone loss or damage due to infection inside of the tooth. It is vital that we take these pictures on a yearly basis as we cannot see or exam the contact areas of the teeth during the exam process. Early detection and treatment of inter-proximal lesions (areas of decay between the teeth) is helpful in preventing further damage and more costly repairs to the teeth. By the time that these cavities become painful it is often necessary to do more invasive treatments which could include root canal treatment and full coverage crown whereas early treatment may have only required a simple filling be preformed. 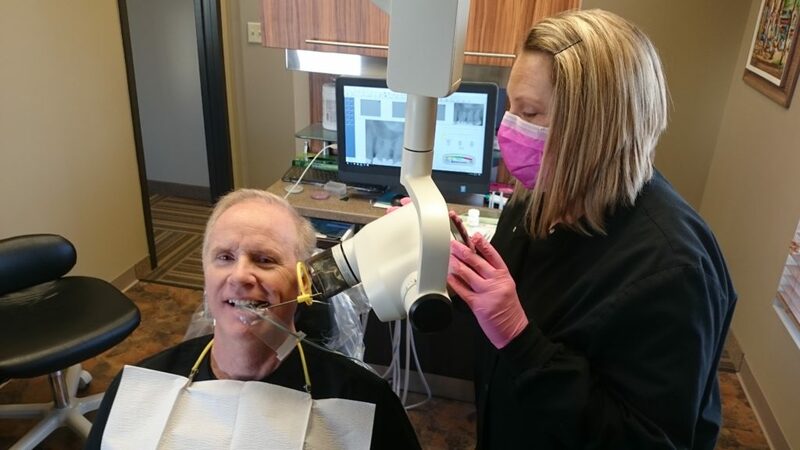 Here we see Dr. Doug getting his Intra-Oral radiographs, we generally take a bite-wing series once a year to check for decay and bone loss between the teeth once. At Cochran Dental we use digital sensors, which allows for a very low X-ray exposure to produce a highly detailed radiograph. Prophy: During the cleaning appointment the teeth will be polished and scaled. To polish the teeth a dental hand-piece and prophy paste is utilized to remove built up plaque ans stain. In most cases the teeth will also have to be Scaled using an hand instrument to remove built up mineral deposits. The amount of time between cleanings will be determined by Dr. Cochran but as a general rule, it is recommended every six months. In some conditions it may be necessary to have the teeth cleaned more frequently such as ever 4 or even every 3 months. Unlike many other dental offices that you may have been previously seen at the scaling is completed by Dr. Cochran himself. This allows for more time for Dr. Cochran to exam the teeth and the overall health status of your mouth. Scaling and Root Planing: This is a deeper cleaning of the teeth and gums, clinically referred to as SRP or a Deep Cleaning. SRP is generally reserved for patients that have sever build up such as when dental care has not been performed in many years or when periodontal disease is present. SRP cleans not only the crown of the tooth but actually goes deeper to the root of the tooth. In periodontal disease inflammation causes attachment loss of the gum tissue to the tooth and results loss of the supporting bone around the tooth. The procedure is normally performed under general anesthesia so that a patient can be more comfortable during the process. Because of the time and use of anesthetic is is most often performed by quadrants in the mouth over the period of several appointments. If time is available Dr. Cochran can perform two quadrants together. It is not always necessary for all quadrants or even all teeth within a quadrant be treated but regardless of the number of teeth the final SRP appointment will include a full mouth prophy like cleaning. After completing the final phase of SRP, it is suggested that a one month follow up appointment be scheduled to determine the results of the treatment with either 3 or 4 month periodontal maintenance appointments until lasting results are seen. Dental Hygiene: While at Cochran Dental, we work diligently to provide the highest level of care and top quality dentistry possible. To ensure that you maintain your dental work and great oral health, this level of care needs to continue at home. We can help you perfect your a dental hygiene skills to help insure that you KEEP THAT PRETTY SMILE®. We can review proper brushing and flossing techniques, discuss the benefits of utilizing an electric toothbrush and a water flosser, along with answering any dental product questions you may have. We recommend the use of an electric toothbrush and have available for sale in the office at a discounted price, Oral-B Professional electric toothbrushes. We also recommend the use of ADA Seal toothpaste and oral rinse products containing fluoride. Please contact us if you have any questions about your current hygiene plan or preventive dentistry.